Be ready for every holiday and season with these 12 Garlands for the Whole Year. From New Year’s Day decor to garlands you can have up from fall through the winter, these seasonal decorations are great for beginning crafters and decorators! This garland is made of pool noodles! What a fun idea! Dress up your pool party with this fun, waterproof decoration! Dried apples make a festive garland you could use all the way through the fall and winter. Use it on your Thanksgiving table, too for a festive touch. This one doesn’t have a tutorial, but it’s pretty easy to figure out! Some fake snow, some little fake trees, and a garland of plastic lights and you’re set to go! It’s almost St. Patrick’s Day! I’m sure you’ve heard the story about St. Patrick driving the snakes out of Ireland…or maybe you think St. Patty’s Day is just an excuse for the entire world to claim their 1% Irish heritage and drink themselves into submission. Whether you embrace the wearing of the green or just take St. Patrick’s Day as an excuse to wear those dumb shirts that tell people how Irish you are (I kid, I kid! ), here are 17 MORE reasons to do what you do…so have a beer, toast up a slice of Irish soda bread (MY LITERAL FAVORITE), and feel yourself getting a little more Irish with this collection of 17 fun facts! 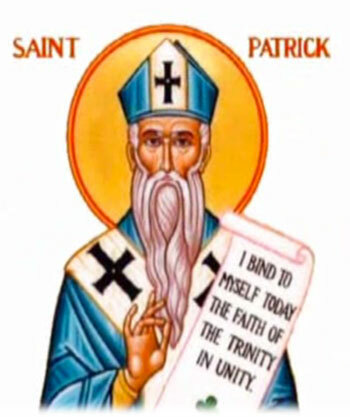 While green seems to be synonymous with St. Patrick’s Day, Saint Patrick’s color was actually blue. The color green only became associated with St. Patrick’s Day after it was linked to the Irish independence movement in the late 18th century. Ironically St. Patrick was not Irish. He was born to Roman parents in Scotland or Wales in the late fourth century. Saint Patrick made his mark in Ireland by introducing Christianity to Ireland. Nevertheless, the Irish take St. Patty’s day VERY SERIOUSLY. It’s declared a national holiday in Ireland and Northern Ireland. The New York Saint Patrick’s Day Parade is one of the world’s largest parades. It’s been a major attraction since 1762! Here in Chicago, we have our own nasty tradition of dying the Chicago River green. It takes nearly 40 tons of dye to color the river. 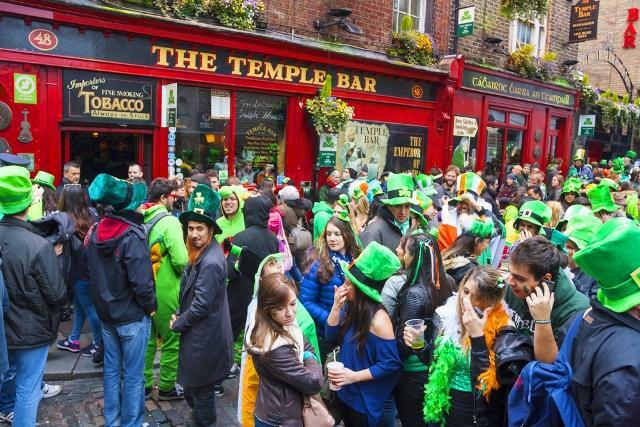 For most of the 20th century, St. Patrick’s Day was considered a religious holiday in Ireland, which meant that the pubs were closed for business. In 1970, the day was converted to a national holiday and the drinks began a’flowin. According to legend, St. Patrick used the three-leaf shamrock as a metaphor for the Holy Trinity when he was first introducing Christianity to Ireland. Though St. Patrick gets all the credit for driving the snakes out of Ireland, modern scientists have actually discovered that Ireland has never been home to any snakes. The cold weather was too harsh to host any reptiles and the surrounding seas have staved off snakes ever since. It’s now believed that the snakes in his lore were likely metaphorical. Not including tips, a 2012 estimate pegged the total amount spend on beer for St. Patrick’s Day around the world was around $245 million. At about $5.00 a glass, that’s a LOT of beer! Saint Patrick was actually born Maewyn Succat, but changed his name to Patricius after becoming a priest. There are more people with Irish ancestry in the United States than in Ireland. Wanna test your luck? The odds of finding a four-leaf clover are about 1 in 10,000. March 17th is actually the day St. Patrick died. Traditionally, the Irish leader hands a crystal bowl full of shamrocks to the US President. The shamrocks, grown in Kerry, Ireland, is immediately destroyed by the Secret Service after the exchange. The luck of the Irish is on everyone’s side today! It may not be gold at the end of the rainbow, but these adorable printables are all coming at you for FREE! How magical is that?! It may be hard to believe, but spring is on the way! To get ready for St. Patrick’s Day, bright and colorful flowers, and warm weather, here are 8 rainbow crafts that are sure to bring a smile to your face! Right, so I know corned beef and cabbage is the traditional St. Patty’s Day go-to…and I know my Irish ancestors would shun me for saying so, but I’m just not a huge fan of corned beef…or cabbage for that matter. I mean…I’ll eat it…but when push comes to shove, I’d much rather spring for a piece of shepherd’s pie or a big ol’ plate of bangers and mash (which I know is not OFFICIALLY Irish, but…it has potatoes!!). So here are a few other Irish-ish recipes that you can make to still be in the St. Patrick’s Day spirit if you’re like me and don’t swoon over the traditional fare.